McCaskill's reluctance to answer questions is indicative of the difficult political situation she's found herself in, needing to choose between pleasing the resistance-focused base by opposing a nominee she's acknowledged is "qualified" for the Supreme Court and crossing party leadership, which has made stopping Kavanaugh's confirmation a top priority. Also at risk is McCaskill's image as a straight-shooter. In 2006, during her first run for Senate, McCaskill said she couldn't imagine not being willing to answer a voter's question if she were elected, calling it her "obligation as an elected official." 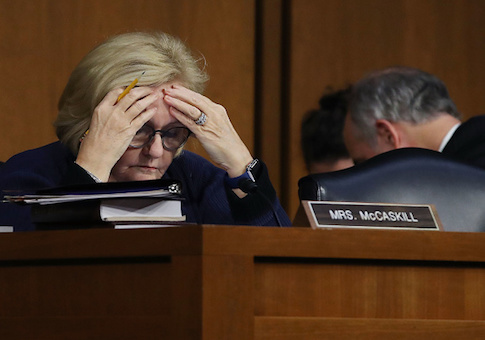 The Missouri Republican Party said McCaskill's refusal to answer the question on Kavanaugh was "ridiculous." "Throughout this entire process, she’s refused to answer any questions about the nomination, and the fact that she said she doesn’t have to answer that question is ridiculous," said state party spokesman Chris Nuelle. "Claire loves to brag about how she answers Missourians' questions, but time and again she’s proven herself wrong. Missouri deserves a senator who will actually answer to Missourians, not Chuck Schumer." "President Trump made a great choice when he nominated Judge Kavanaugh for the Supreme Court, and this should be a no-brainer for Claire McCaskill," Nuelle said. Liberal groups have also grown angered by her "hedging" on the issue, the Kansas City Star reported last week. Most Democratic senators have already come out against Kavanaugh's nomination, with only McCaskill and others in similar electoral situations remaining on the fence. The left's pressure campaign against McCaskill was criticized by the left-leaning St. Louis Post-Dispatch editorial board, which urged McCaskill to vote yes on Kavanaugh, pointing out that a vote against him "could easily cost her the Senate election" against Republican Josh Hawley. "Why are liberals so anxious to box in McCaskill on a confirmation vote that won't make a difference but could easily cost her the Senate election?" the paper asked. "Sometimes you look over the battlefield, accept that victory is beyond your grasp, and prepare to fight another day. When that next fight comes, would liberals prefer to be directing their outraged demands at Sen. Hawley?" McCaskill had previously said she was waiting for Kavanaugh's confirmation hearing, which came last week, to make a decision. He will likely be confirmed regardless of whether McCaskill votes for him or not.